Located in the heart of picturesque Wanaka and a stone’s throw from the lake edge, these luxurious apartments are the perfect place for your special day. 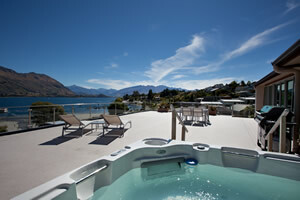 Whether you require luxurious accommodation for your guests or an intimate wedding ceremony on the Penthouse balcony, relaxation and romance are on the menu with awesome views of Lake Wanaka and the mountains beyond. Penthouse apartments have a private six person spa and BBQ. Guests are accommodated in one, two and three bedroom serviced apartments. All apartments have a designer kitchen, two bathrooms, including one ensuite and one with spa bath, spacious living and dining areas, private balconies and secure garages. Whatever the season, these spacious apartments can cater for your every need with facilities on site including swimming pools, spas and BBQ. Located in the heart of the town and across the road from the Lake Wanaka Centre, Wanaka’s restaurants, cafes, bars and shops are just around the corner. With our in-house Wedding Organiser we can arrange all aspects of your special day from a full wedding to purely accommodation for your friends and families. Contact us today for a quote.